A prominent member of Jordan’s Muslim Brotherhood has given an interview to an Amman daily in which he discusses the differences between the struggle for political reform inside Jordan and events elsewhere in the tumultuous “Arab Spring” (al-Dustur [Amman], November 24). Rahil Gharayibah is the deputy secretary-general of Jordan’s largest single political party, Jabhat al-Amal al-Islami (JAI – Islamic Action Front) and a frequent spokesman on its behalf. Founded in 1992, the JAI is generally regarded as the political wing of the Jordanian Muslim Brotherhood. This has not, however, precluded the participation of the Brotherhood in demonstrations calling for the dissolution of parliament and the resignation of Prime Minister Dr. Marouf Sulayman Bakhit, a former Major-General whose reform efforts were ineffective, leading to his eventual resignation in October after only 8½ months in power. Bakhit’s reluctance to reopen the constitution for major changes was a sticking point with the Muslim Brotherhood, which seeks constitutional reform. Though the Brotherhood is advocating a type of constitutional monarchy for Jordan, Gharayibah has still been a harsh critic of King Abdullah II’sexisting powers. In a rally held in Amman in September, Gharayibah insisted that Jordanians would “not be slaves or serfs on anyone’s estate… Is [Jordan] an estate owned by one person? Are its people his serfs?” (al-Akhbar [Beirut], September 3). The Jordanian Muslim Brotherhood is considered to be closely tied to the Syrian Muslim Brotherhood and has been very vocal in its support for the opposition Syrian National Council. Though it rejects Western intervention in Syria, it favors an “Arab solution,” including military operations by Arab states, to resolve the Syrian political crisis (Jordan Times, November 24). This article first appeared in the December 1, 2011 issue of the Jamestown Foundation’s Terrorism Monitor. Shortly after the Jordanian Arab Abu Hafs al-Urdani succeeded the late Abu Walid as the commander of the foreign mujahideen in Chechnya, his death or detention was declared a priority for all of Russia’s secret services. (RIA Novosti, December 15, 2004) After a decade in Chechnya and two years of nearly constant combat operations as the leader of a mixed force of Turks, Arabs and diasporic Chechens, the Jordanian mujahid was finally killed on November 26 by Russian security forces. False reports of his death have circulated in the past, but this time a report from the Chechen Eastern Front headquarters confirmed the Jordanian’s death several days later (Kavkaz Center, November 29). Abu Hafs (real name Farid Yusuf Amirat) was described by Russia as the financier of the Beslan attack and a personal acquaintance of Osama Bin Laden. What is certain is that the Jordanian was involved in fundraising for the Chechen movement while playing an important role in organizing and leading military operations. With years of combat experience in Chechnya behind him, the 33-year old Abu Hafs was heavily involved in training new mujahideen as well as commanding the Eastern Front of resistance operations. His al-Qaeda connections have never been verified; while not as dismissive of the terrorist group as other Chechen leaders, such as Aslan Maskhadov, Abu Hafs made no public claim of affiliation to Osama Bin Laden. This did not prevent Abu Hafs from being cited by then-U.S. Secretary of State Colin Powell as a leading member of Abu Musab al-Zarqawi’s “terrorist network” in February 2003. The allegation, made during a presentation before the UN Security Council, was part of an unlikely description of Georgia’s Pankisi Gorge as a major centre of al-Qaeda chemical warfare activities. At times, Abu Hafs expressed hostility to the United States, though this does not appear to have been encouraged by the Chechen leadership. In an interview earlier this month, Abu Hafs addressed the poisonous legacy of the Abu Ghraib prison scandal: “The Abu Ghraib prison serves as the greatest proof of the fallacy of the American agenda. How shall we trust America after all this?” (Vakit [Istanbul], November 12) Since the current war began in 1999, the Chechen view has been to avoid unnecessary antagonization of the United States. If the United States would not support the Chechen struggle, goes the thinking, then it would be better that it remains uninvolved, rather than provide military support to Russia. Following a tip, Russian security forces surrounded a house in Khasavyurt. By 6:15 AM, a mixed force of Dagestani police and Alfa (Special Forces) units of the FSB were prepared for the assault on the suspects’ house. Without warning, two militants were shot by snipers through the windows, while the other three being offered a chance to surrender, according to the FSB (Kommersant, November 27). The FSB report states the operation lasted four hours, though the actual fighting lasted only 30 minutes. A later media report claimed that three women and five children ran out the back door when sharpshooters opened up on the house. In this version, security forces continually fired on the house for 2.5 hours (NTV Mir, November 26). The Chechen Eastern Front HQ report described a daylong battle with only three mujahideen killed (Kavkaz Center, November 29). When the house was searched, the body of Abu Hafs was discovered together with one Chechen and two Dagestani militants, all dead. Security forces also reported that they found an assassination list containing targets from within the local police, as well as assault rifles, machineguns, grenades, explosives and ammunition. The FSB report claimed that Abu Hafs was in Dagestan to “engineer and commit large-scale terror acts” (ITAR-TASS, November 26), but an FSB spokesman added that Abu Hafs may have been in Dagestan attempting to flee the region, “given the lack of prospects for jihad in the North Caucasus” (Interfax, November 26,). As winter approaches, the Chechen resistance typically reduces its forces in the field, sending many to winter quarters in other parts of the Caucasus. Abu Hafs may have been in Dagestan to organize rebel operations, though travel outside of the resistance lines would have been very dangerous for the commander, who was quite obviously Arab in appearance. The killings in Khasavyurt came only days after reports had emerged that Sadval (a militant separatist group based in the Lezgin ethnic group that straddles Dagestan and northern Azerbaijan) was planning to cooperate with existing Dagestani insurgent formations to break up Dagestan in preparation for the establishment of a North Caucasus caliphate (APA [Baku], November 22). There seems to be no obvious successor to Abu Hafs as the leader of the foreign mujahideen. Chechnya has declined as a destination for Arab jihadis since Coalition operations began in Iraq in 2003. It may be time for a Turk to take command, reflecting the changing composition of the foreign mujahideen in Chechnya as well as the growing reliance on donations from supporters in Turkey. Abu Hafs was deeply involved in nurturing the Turkish connection, training Turkish volunteers for jihad and appearing in fundraising videos distributed in Turkey. The FSB described Abu Hafs as “the actual head and financier of bandit formations in Chechnya,” implying that Chechen resistance to Russian rule is managed by foreign terrorists like Bin Laden (RIA Novosti, November 26). These claims seem improbable; the Chechen insurgency remains ethnic-nationalist at its core and could never be led by a foreign militant. Refuting Russian claims, Abu Hafs declared, “All commanders are in obedience to [Chechen President] Dokku Umarov.” At the moment, there is no evidence that Umarov’s command is disputed; on the contrary, he is a veteran fighter who is well respected within the ranks of the mujahideen. While Abu Hafs may have handled some foreign donations, the Chechen resistance is unlikely to have placed all of its finances in the hands of a single person, as suggested by the FSB. The Chechen nationalist movement has been very successful in establishing systems that can withstand the death of an individual, as seen in the orderly transition of power each time a Chechen leader or foreign mujahideen commander has been killed. It appears that Russian security forces nearly pulled off a dual decapitation of the Chechen resistance last week, with Russian reports claiming that Chechen President Dokku Umarov was wounded and nearly captured during a three-day operation in the region of Achkhoi-Martan (Kommersant, November 24). The attack was allegedly based on information regarding Umarov’s whereabouts supplied by the 35 militants who had surrendered at Gudermes. These supposedly included members of Umarov’s inner circle, though such mass surrenders in the past have included many ex-fighters who have been inactive for years. Ironically, Russia’s success in eliminating Arab mujahideen leaders makes it increasingly difficult to maintain their depiction of the Chechen resistance as a movement led and controlled by al-Qaeda. Logic would suggest that the Chechen nation is not large enough or unified enough to be able to replace the many resistance leaders who have fallen in combat over the past few years. It has also become difficult to attract capable foreign militants in sufficient numbers and to keep the Chechen struggle in the public consciousness of the Islamic world. An important function of the foreign mujahideen and its commander is to keep foreign interest alive in order to raise much-needed funds from Muslim communities. Operational leadership is becoming a problem for the Chechens as commanders become ever younger and more inexperienced. The loss of veteran warriors like Abu Hafs is a major blow to the resistance, but before his death, the Jordanian remained optimistic about Chechnya’s ability to renew its leadership: “These young commanders are full of advantages and honor; jihad in the way of Allah has raised Chechnya. We should not forget that a lion cub is also a lion” (Vakit [Istanbul], November 12). A little known veteran jihadist, Abu Hafs al-Urdani, made a rather dramatic entrance onto the world stage on February 5, 2003, when U.S. Secretary of State Colin Powell displayed his photo in a speech before the U.N.Security Council. Abu Hafs was identified as part of fellow Jordanian Abu Musab al-Zarqawi’s “Iraq-linked terrorist network.” (Abu Hafs al-Urdani is not to be confused with al-Qaeda leaders Abu Hafs al-Masri, who is deceased, or Abu Hafs al-Mauritani. Al-Urdani also has no connection to the Abu Hafs al-Masri Brigade). In 1996, Abu Hafs relocated to Georgia “on Osama Bin Laden’s order” to take charge of al-Qaeda operations in the Pankisi Gorge. 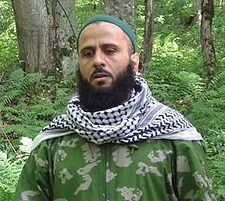 Abu Hafs is allegedly in charge of the distribution of all al-Qaeda funds sent to Chechnya. (Before his death last year, Russian intelligence usually attributed this role to al-Walid.) Abu Hafs is also described as having been in charge of weapons supplies to the fighters in the Pankisi Gorge. (This statement implies that arms were being shipped in to the fighters. Aside from the practical difficulties of such international shipments, it is known that Gelayev arranged the re-outfitting of his men from Georgian sources in exchange for joining the fighting in Abkhazia. Russian arms are also available from the cash-strapped Russian rump garrisons in Georgia). In the FSB’s account, Abu Hafs returned to Chechnya in 2002 at the request of Khattab’s successor, Abu al-Walid. After his return Abu Hafs took a second wife, the widow of Yemeni mujahideen leader Abu al-Ja’afar. 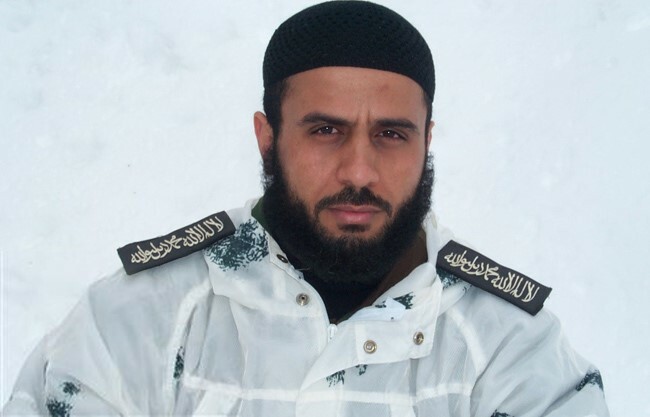 Abu Hafs’ picture was recently published on the website of the “Chechen Informational Center,” posing in the firing position with a weapon in a white winter uniform and traditional Chechen lambskin hat. Abu Hafs followed this statement with another on September 19, 2004, in which he berates the failure of Arab leaders to support the Chechen struggle as “treason against Allah.” The mujahideen leader also declared “the commencement of attacks on Russian and American interests in Chechnya after having observed that the Russian and American sides continue to [attack] the honor and dignity of Islam and the Muslims in Chechnya, Palestine, Iraq, Indonesia, Afghanistan, and in other Muslim countries” (Communique from Abu Hafs al-Urdani, September 19, 2004). The statement is unusual in its targeting of the U.S., something typically avoided by Chechen militants. Even Basayev prefers to forgo threats to the U.S. in favor of warning the U.S. of the consequences of inaction as Russia descends into dictatorship. If Abu Hafs is to have a longer career than al-Khattab and Abu al-Walid as leader of the foreign mujahideen he will need to keep a low profile. Antagonizing the U.S. is unlikely to contribute to his safety, especially in view of the alleged American surveillance contributions to the demise of Chechen President Dzhokar Dudaev and warlord Ruslan Gelayev. Without a public presence, however, Abu Hafs will have difficulty in keeping the Chechen struggle in the field of vision of the international Islamist donor community.